At the Knowledge Generation Bureau, the agents who answered questions on our microwork platform needed a way to discuss puzzling questions and to generally coordinate their work. 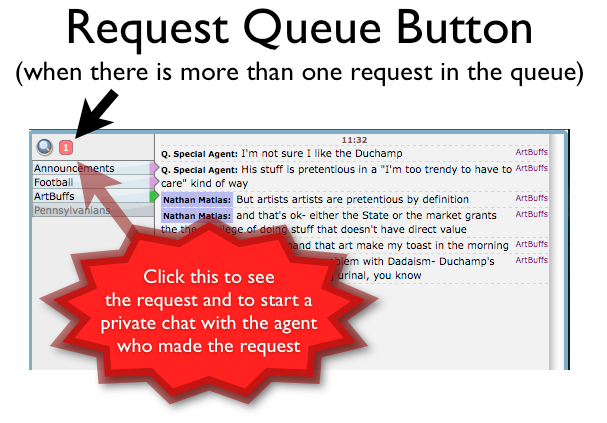 With thousands of agents, no single chat room would suffice. Furthermore, agents needed as much screen space as possible allocated to other purposes, in order to focus on research and answers. To solve this challenge, we designed, built, and integrated a "multi-room chat" into their work console. Agents who had selected multiple rooms could easily post and watch all of their selected rooms at once. They could also begin private chats and manage support tickets in the same space.